In the last tutorial we learned how to use if statement in C. In this guide, we will learn how to use if else, nested if else and else if statements in a C Program. If condition returns true then the statements inside the body of “if” are executed and the statements inside body of “else” are skipped. If condition returns false then the statements inside the body of “if” are skipped and the statements in “else” are executed. In this program user is asked to enter the age and based on the input, the if..else statement checks whether the entered age is greater than or equal to 18. If this condition meet then display message “You are eligible for voting”, however if the condition doesn’t meet then display a different message “You are not eligible for voting”. * condition specified in the "if" returns false. When an if else statement is present inside the body of another “if” or “else” then this is called nested if else. //Nested if else inside the body of "if"
//Statements inside the body of nested "if"
//Statements inside the body of nested "else"
//Statements inside the body of "else"
The else..if statement is useful when you need to check multiple conditions within the program, nesting of if-else blocks can be avoided using else..if statement. //These statements would execute if all the conditions return false. Lets take the same example that we have seen above while discussing nested if..else. We will rewrite the same program using else..if statements. As you can see that only the statements inside the body of “if” are executed. This is because in this statement as soon as a condition is satisfied, the statements inside that block are executed and rest of the blocks are ignored. 1. else and else..if are optional statements, a program having only “if” statement would run fine. 2. else and else..if cannot be used without the “if”. 3. There can be any number of else..if statement in a if else..if block. 4. 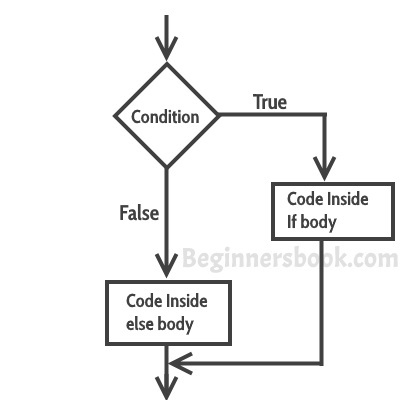 If none of the conditions are met then the statements in else block gets executed. 5. Just like relational operators, we can also use logical operators such as AND (&&), OR(||) and NOT(!). All the informations relating to ‘if’ condition are very useful. Now, you are requested to share how to apply ‘and’ condition.